Australians are renowned for their disrespect for authority. Usually this is cast as a healthy disrespect, as if the very notion of authority sits uncomfortably on the broad shoulders of your average laconic Aussie. We seem to regard ourselves as perfectly entitled to tell anyone in authority to “get stuffed”, especially if that person is an effwit and violates our inviolable code of a “fair go”. Anywhere else in the world, national leaders can expect deference but not here. We voted the bastards in and we can vote them out. And they’ll bloody well put up with whatever we dish out to them. 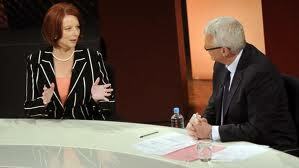 Prime Minister Julia Gillard’s latest appearance on ABC Television’s Q and A program is conclusive proof that this disrespect has gone too far. A few years back, eyebrows were raised when television host Ray Martin took it upon himself to address then Prime Minister Paul Keating as Paul and later, John Howard as John. Martin, at least, was “Mr Australia” at the time, the darling of the blue rinse set and ubiquitous on our screens as the host of choice for everything from election debates to Carols By Candlelight. Now, ordinary members of a studio audience think nothing of addressing the PM as Julia, as if addressing an equal when she’s nothing of the sort. We clearly weren’t alone in our discomfort with this overfamiliarity. One viewer wondered by Tweet if it was because she was a woman that the PM got to be addressed by her first name. But did anyone – even the cheekiest Aussie – dare to call Mrs Thatcher Margaret? As it happens, Grubsheet can’t abide Julia Gillard and cringed every time she began answering a curly question with a schoolgirl giggle. With her government unravelling, every question nowadays is a curly one, be it her relationship with her predecessor, Kevin Rudd, the leak from her office that Rudd is “out of control” or the ultimate in creepy-cringe, her lachrymose speech last week to the US Congress. Gillard and her advisors seem to think a strangled, faux cackle is the best way to defuse an incoming Exocet from the studio audience. Yet this is just another insult to our collective intelligence, modest as that might be. On this performance, The Prime Minister will be cackling all the way out the front gate of The Lodge. Some deluded viewers seemed – by their mindless Tweets – to believe that this was a triumphant outing for the PM. One sympathetic commentator – Fairfax Media’s Phillip Coorey – argued that while she hadn’t won any votes, she hadn’t lost any either. Yet to us, the faces of the studio audience said it all. When she appeared on Q and A before the election, the audience cutaways ranged from avuncular to the kind of beatific adoration normally reserved by parents for junior’s first school play. At best, this time the faces were quizzical, doubtful or disengaged. At worse, they were cynical, even hostile. On the countenance meter, Gillard is gone. That said, she is still Australia’s national leader, the person guiding us through the suddenly more perilous shoals we find ourselves in. I was going to say “the person we elected” to guide us but that isn’t strictly true. Yet even if she governs by default – propped up only by the Greens and independents – she’s still “the chosen one”, wearing the mantle – however unsteadily – of Barton, Curtin, Chifley, Menzies and all the others who came before her. The office itself warrants respect and Gillard deserves to be addressed as Prime Minister, not Julia, just as Obama is Mr President and not Barack. But in its disrespect, perhaps the audience is only taking its cue from the ABC, which sunk to new lows last night by ambushing the PM with a gratuitous video question from the computer hacker and fugitive from Swedish justice, Julian Assange. It’s one thing for the public broadcaster to so spectacularly fail in its charter obligation to inform – as it did with the miserable performance of News 24 at the weekend – but quite another to actively participate in the crudest of political stunts. Enabling Julian Assange to accuse the Prime Minister of treason in a pre-recorded segment paid for by the Australian taxpayer isn’t just the height of disrespect. It’s an outrage. It's even worse when the ABC admits that it approached Julian Assange offering him the chance to ask the PM a question. This makes it a set-up cooked up by ABC staff to score a political point. What other explanation is there? I'm amazed to see the ABC's "Director of Communications" defending what happened. These guys have lost the plot. At the very least, the executive producer of Q&A should be forced to resign. Anything less is a travesty. Hi Graham, great blog! Just wondering if you have twitter so I could follow?